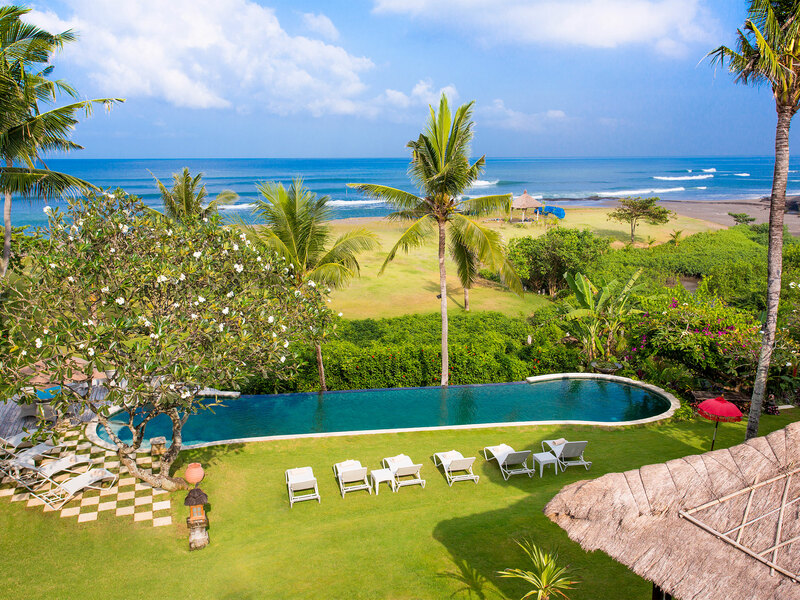 The beautiful traditionally styled Sungai Tinggi Beach Villa rests on the shores of a pristine black-sand beach in the peaceful rural village of Pererenan, on Bali’s southwest coast. Sungai Tinggi Beach Villa comprises a main four-bedroom villa and a secluded two-bedroom riverside guesthouse offering six bedrooms in total, a glorious open-sided living and dining pavilion, lush gardens and an 18-metre infinity edge pool. This blissful villa sits on the banks of a small lagoon, where the river meets the sea, with over 100 metres of beach frontage overlooking one of Canggu’s most famous surf breaks. Soft rolling lawns hug the landscape’s natural contours while a free-form 18-metre infinity swimming pool blends seamlessly with the ocean all the way to the horizon. The garden, bursting with fragrant frangipanis, swaying coconut palms and luscious green foliage, is a stunning private oasis, and amidst its tropical expanse lies the villa’s dedicated events space – a coconut grove directly connected to the beach via a pretty timber walkway, which makes an unforgettable setting for nuptial vows. 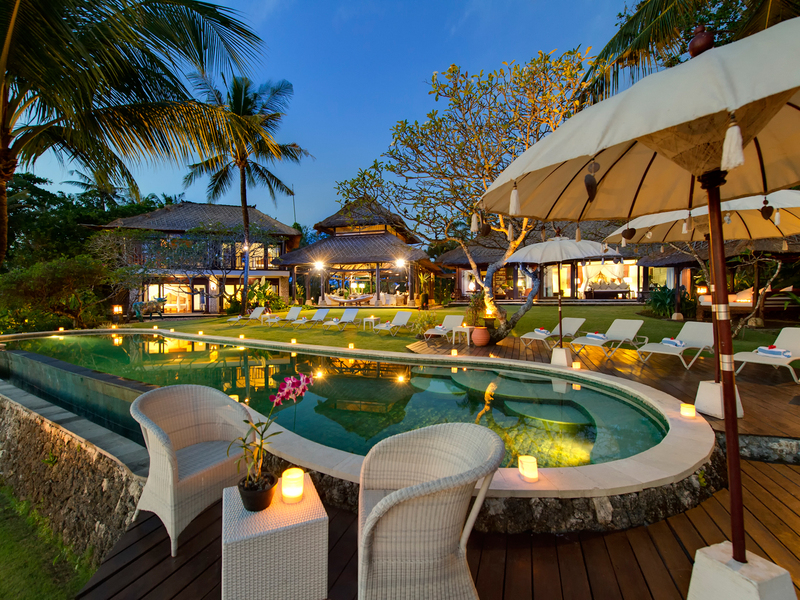 Sungai Tinggi Beach Villa feels like a celebration of Bali, and the owners’ love and passion for the island is evident in the fine selection of local materials and stunning collection of handpicked artworks that liberally adorn the property. 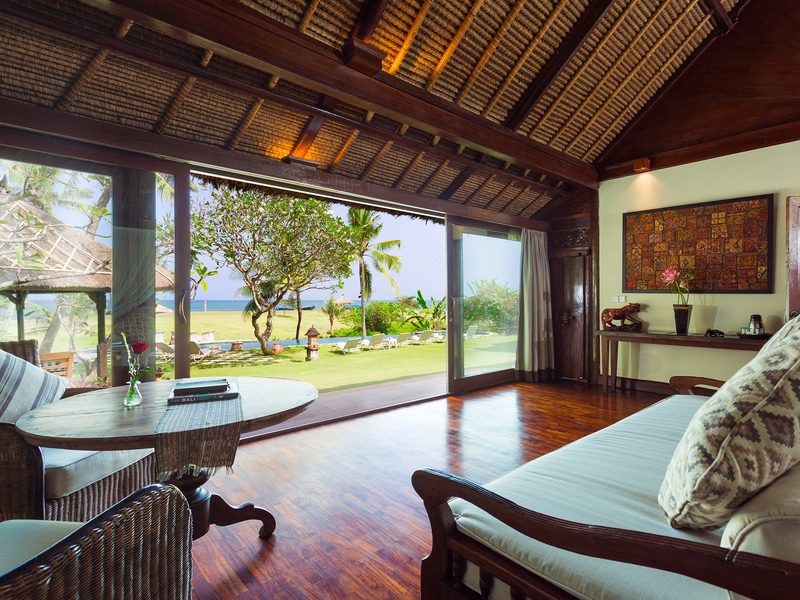 Exotic timber floors, coral-limestone walls and alang-alang thatched roofs mix delightfully with antique artefacts and weavings to give the villa its distinctive style and ambiance. The friendly staff, many of whom reside in the local village, have a strong attachment to the villa and clearly love taking care of its guests. Families and groups of friends will find the main villa abundantly spacious and the private two-bedroom guesthouse with its own kitchenette and dining areas a delightful additional venue to sleep, relax and unwind. Play a match on the tennis court, enjoy a massage, admire the sunset from the balcony or converge on the imposing living pavilion – you’re simply spoilt for choice.